This was a big hit at work. One of my colleagues is leaving to go and teach in Madrid and has requested some to be sent to him! I made 12 large slices, however the consensus at work was that they were a little on the big side so you could make the slices slightly smaller. The recipe says to use a 10 x 5 inch pan however I used a slightly larger one and found this a bit too small so you could go even bigger. You could easily adapt this recipe to use any other type of jam. 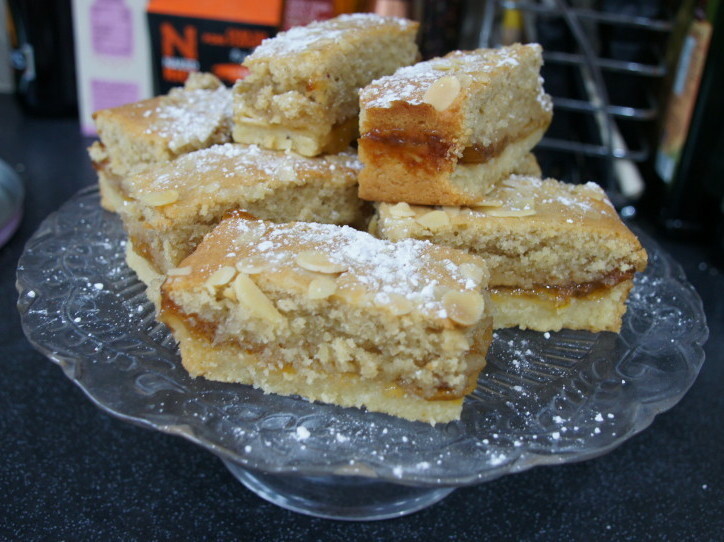 Raspberry or apricot would be lovely – just use almond extract instead of the cinnamon to flavour it. 1) Preheat your oven to 170C. Grease and line your baking tin (10 x 5 or slightly larger) with baking parchment. 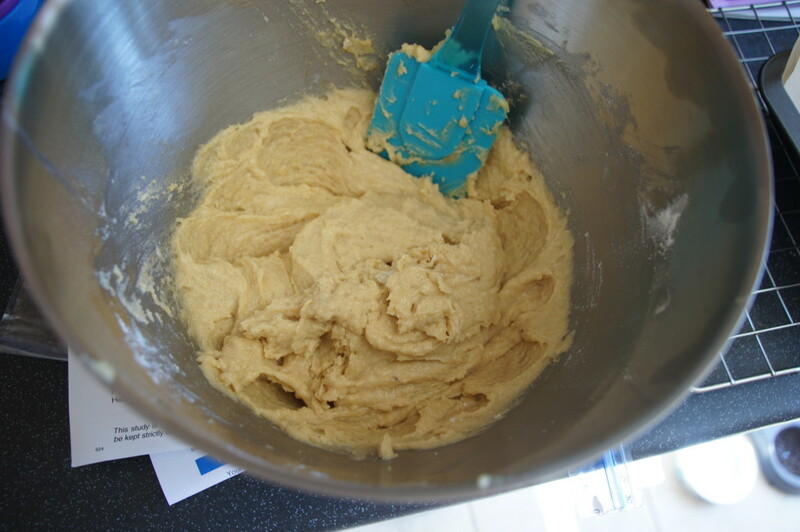 2) In a free standing machine, food processor or with a hand-whisk, bring together the butter, ground almonds and sugar. 3) Put half the mix into a bowl. Add the plain flour to the remaining half, mix until it forms a clay like dough, spread an even layer with your hands into your pan, bake for about 12 mins. Set aside to cool. 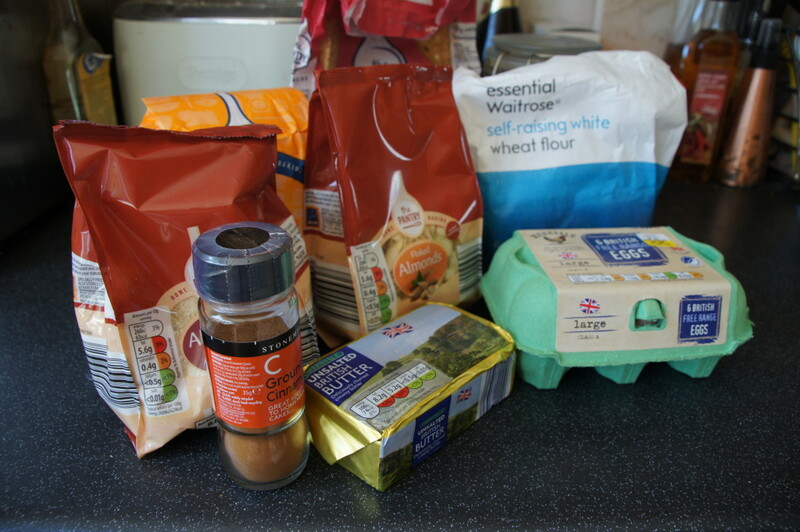 4) Put the remaining dough back into your choosen mixing machine, add the self-raising flour, eggs and cinnamon and beat together until well combined. 5) Spoon your jam over your biscuit base. Next spoon dollops of the frangipane mix over the jam then spread with a palette knife. 6) Sprinkle over some toasted flaked almonds. Bake for about 25-32 mins until golden and a skewer comes out clean when dipped into the centre. 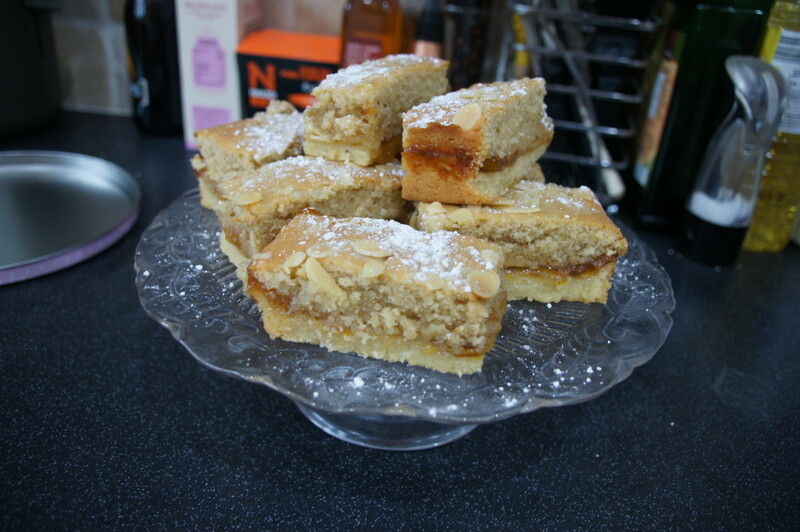 Leave to cool slightly before marking into slices, then dust with icing sugar.